Der Zielplanungsprozess sollte gut vorbereitet sein. Wie du deine Mitarbeiter in der Vorbereitung unterstützen kannst & welche Fragen sie sich vorher und im Ziel-Workshop selbst stellen sollten erfährst du hier. Goals are a great motivator. They help us focus our attention on relevant things, save us time and energy. For a goal to actually get this job done, it needs to meet certain critera - otherwise it's just wishful thinking. The criteria are SMART: Specific, Measurable, Attractive, Realistic, Timely. If you make your goals smart, you make sure they are actually achievable. Many times, we don't achieve our goals because they are not smart. Think about it: What was the last goal you were aiming at? Was is a smart goal? Let's take a closer look at the criteria! Make your goal specfic to know what it is exactly that you want. Example: You want to become more athletic. Looking at this goal from an outsider's perspective: I don't know what you are talking about. It's just unspecific. I don't understand what more athletic means, I am not sure if it's related to a change of behavior, I don't know anything. Of course, you are expecting - as a result - to be more athletic afterwards but that is just the result of your goal. And now you might be thinking: Well, if that is a goal, then it's nothing but a do-to-list. If you think it through, that might be right. And if you think it through to the end: our whole life is a to-do-list. If we didn't know what to do to get us where we want to go, we would still be in our parents place on the couch, watching TV. A goal is measurable if you can put numbers to it in some way. It could be the time you spend on an activity or even the number of times you repeat a certain activity. The important thing about it is, that you measure the input, not the output. Many times, we can be certain of the activities we are planning but not of the outcome we will get. Example: I will become more athletic. More athletic is still not specific and if now you are trying to measure it: How will you measure how athletic you are? Maybe if you look at the kilometers you run. But then your goal would be to run 5 km in 20 minutes - not simply "run faster". The same applies for any work related goal such as: Increase revenue to xy within the next months. Or improve website stabilty by xy %. Both cases give you an output-oriented number. This also relates to how realistic things are, but we get there in a minute. The measurable part aims as actually being able to measure it. If you want to improve communication: how will you measure it? Choose something that is measurable, e.g. develope ONE concept for a feedback process. Most important when it comes to goals is that you actually want to achieve this goal. It happens many times, that we put an activity onto the list which we hope, would bring us to the result we desire. Many times, we don’t even enjoy the activity and also don’t get anything out of it. It just keeps us busy. If you set your goal with a starting day 7 days ago and notice today that you haven't done anything yet, to move towards achieving your goal, ask yourself why that is. Don't feel bad because of not taking actions yet and don't make new plans around how to change your behavior to actually start it. What you should do is question whether this is actually attractive to you. I will give you two examples: This year I was preparing for a tournament. I was thinking, what I need to be successful is to be more fit. So I put together a very nice workout plan, put all the to-do's into my calendar (daily activities) and from the first day on, I did not do it - not even once. I made it through the tournament anyways. Eventually, I realized though, that the activities I had planned, were not attractive to me at all and I also knew - probably unconsciously - that the activities would not support my goal with the tournament. Later on I found out, that the thing I would have actually needed was't fitness but relaxation. The other example is about a change of diet. Last year, I had some health issues and I knew they were related to certain types of food. From one day to the other I completely changed my diet for about 4 months until I was better. If I had to change my diet right now (I don't have those health issues anymore), I would have a very hard time and would probably start all over every single day. That is solely to the fact that now it's not attractive anymore. I don't have any reason for a change. A goal needs to be owned by you. If you are not the one who can influence it, it’s not realistic. If you set yourself a goal that requires 100 hours of input and you only have a week to get it done, it's not realistic. If you want to double your revenue and maybe just need one single customer for that: how realistic is this really? You are not able to predict anyone's decision. What you can do though is to predict your own activites and behavior. If you want to send out 100 Thank you notes, you know that you can do it. When you plan your goals, also check the time that you will need. Check the time of the activities you are planning to achieve the goal and also the time you need to get your other, everyday operational tasks done. One time, when I did my goals, I noticed that I would only have 20 hours in three months to get all the operational things done. It's obvious that that is not realistic. The timeline for your goal should be overseeable. If you know what the next three weeks will look like, three weeks is a good time frame. If you set yourself goals that are as long-term as one year, it takes you too long to enjoy your success. There are more steps on the way to this long-term goal. Define them as goals and be proud and happy, every time you reach one of them. You will be able to adjust other “meantime” goals and get a better feeling for being on the right track. If you have a very long-term goal, you don't need to set it as a goal. Of course, it's the ultimate goal but in the end, the small milestones are the ones that count. In the meantime, it could happen, that the overall, ultimate goal is not as important anymore or priorities and context changed. What is it exactly what you want to contribute? Why are you doing it? Is there a different way to achieve the reason behind it? How many words do you already know? For what reason are you doing it? When do you need german? How do you know you achieved your goal? That is the output you can't influence. What is the value add you will deliver to your customers? How do you want to go about - increase reach, revenue or retention - increase touch points with potential customers? Maybe it can rather be a learning goal such as: understand why our customers buy our products? Come up with a learning goal instead of a performance goal. If the goal is, to learn how to do it better, the chances that you will be successful are higher. If you set yourself a performance goal and fail by far, you will be discouraged, especially if you are a very diligent person. Don't choose a goal that is overwhelming - it should be challenging but not too easy. Try to find the right measure and adjust your goal if you notice it's too easy or too hard. Double check your goal with someone who is not from the field. If they don't understand, it's probably not specific. Also, they will raise questions that let you think things through again. Double check your goal the next day. If you still like it and find it reasonable, you should go for it. 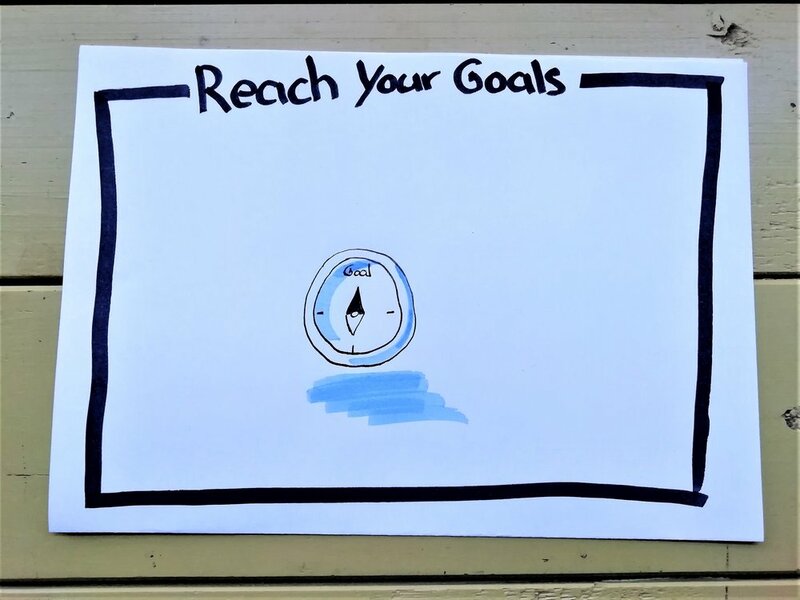 Check how much time your goal will require. Think through if you actually have that time.